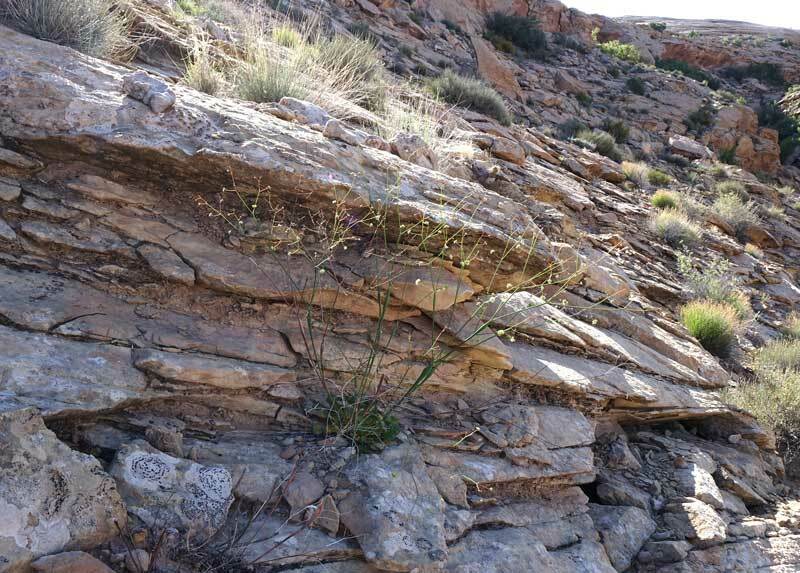 Click to read about Eriogonum. Desert, semi-desert. Openings, shrublands, canyons. Spring. Above and left: Lower Butler Wash, Utah, April 20, 2017. McElmo Canyon, Canyons of the Ancients National Monument, April 27, 2005; Gateway, Colorado, area, May 11, 2012; and Hidden Valley Trail, Utah, April 23, 2014. 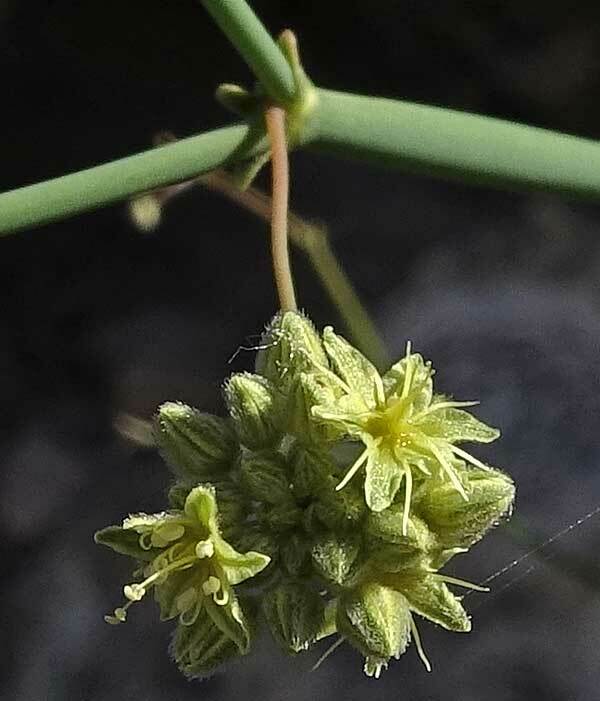 The swollen stems of Eriogonum inflatum make this an unusual and easily remembered plant. 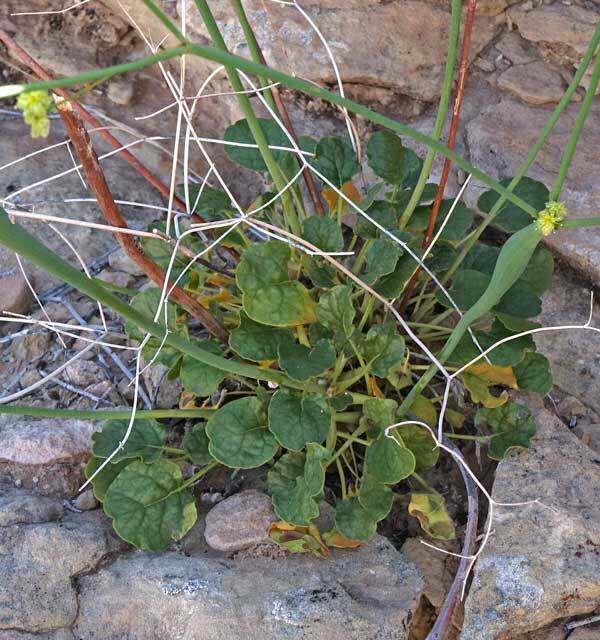 Very tiny yellow flowers are often not even noticed except in years of unusually favorable rainfall when thousands of these tiny flowers give a yellow glow to sandy flats and rocky hillsides. 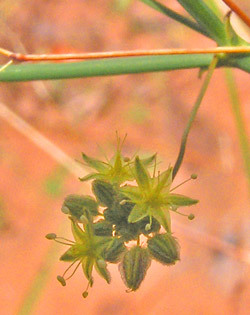 The second photograph shows a considerable enlargement of the flowers, which appear as tiny dots at the end of the dark branchings in the top photograph. 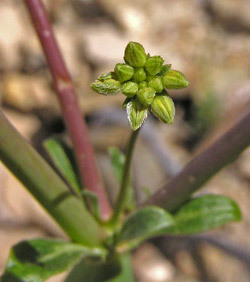 The Eriogonum genus was named by Andre Michaux (1746-1803) in his 1803, Flora Boreali-Americana. 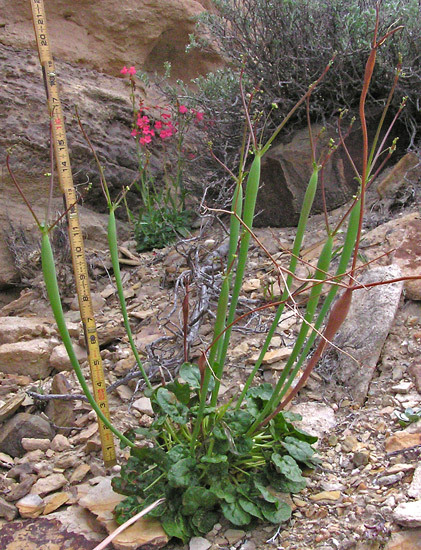 John Torrey and John Fremont named this species in 1845 after Fremont collected it in 1844 "on barren hills in the lower part of Northern California". Fremont's name appears alongside Torrey's name as co-author because the wild explorer Fremont had the gall to tell Torrey, the greatest botanist of his time, that after Fremont collected plants, "we" should describe the plants together. (More biographical information about Torrey) (More biographical information about Fremont). "Erio" is Greek for "wool" and "gono" for "knee", referring to the woolly leaves and swollen joints of the type species. 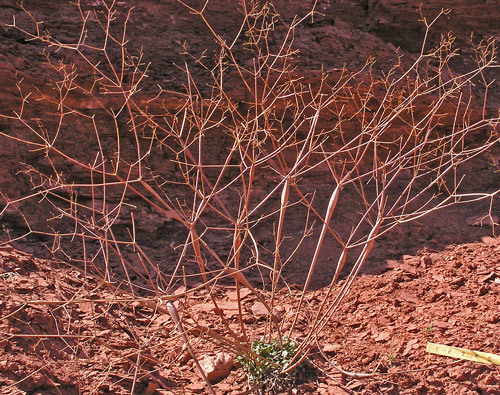 The top-branching corymb pattern of Eriogonum inflatum is visible from far away, especially on a plant that bloomed as profusely as this one. Notice the ruler in the lower right corner. 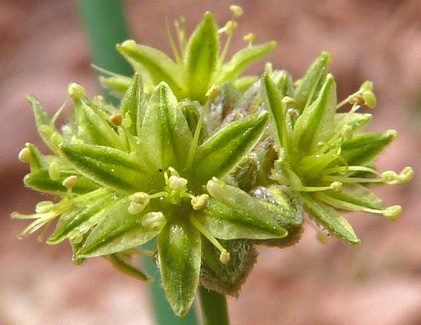 Flower buds appear at the end of very delicate branchings above the swollen stem and between minute bracts (just 1-3 millimeters long and wide). 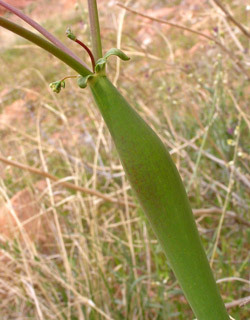 The peduncle lengthens and changes from red to green. Tightly packed clusters of over a dozen hairy, tiny buds emerge. 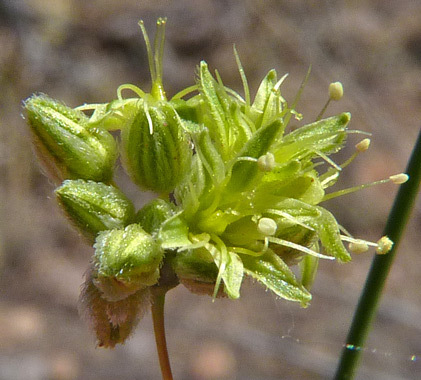 1-3 millimeter wide flowers have 1.5-2.5 long exserted stamens.